The Special Stages in Sonic Mania are a brand new kind of Special Stage which draw inspiration from many other Special Stages in the series, such as the flat track layout and the objective of chasing UFOs from Sonic CD, collecting spheres for speed like in Sonic Heroes, and even the birds and fish as decorations from the Sonic 1 Special Stages. As in Sonic 3 & Knuckles, the Special Stages are accessed by giant rings hidden in secret rooms scattered across the zones. The Special Stages are different in both Mania and Encore Modes, with the Special Stages in Encore Mode being harder and cycling through the backgrounds in reverse order. The Special Stages are set on flat race tracks with parallax backgrounds of varied themes like in Sonic CD. The objective is to run through the stage and chase the UFO that is carrying a Chaos Emerald. In order to collect the Emerald, the player must collect blue spheres. By doing so, the player will fill a gauge at the top of the screen, and when full, the player's speed level increases, allowing the player to gain on the UFO but also making control more difficult. The player starts at Mach 1, and by collecting enough spheres the player's speed will reach Mach 2, and eventually Mach 3. 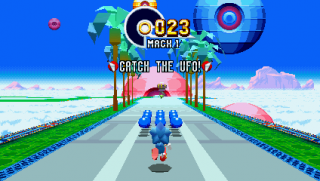 Once at Mach 3, all blue spheres will begin flashing yellow, and from that point on collecting them will no longer increase the player's speed, but instead increase the Mach Bonus awarded at the end. Not only must the player collect blue spheres, but they must also collect rings, as they serve as the time limit for the Special Stage, similar to the Special Stages from Chaotix. The more rings the player collects, the more time they have to catch the UFO. The player starts with a small pool of rings when the Special Stage begins, so collecting a healthy supply of rings from the get-go is generally a good idea. While blue spheres regenerate after being collected, rings don't, so the player cannot prolong the Special Stage indefinitely. Of course, no Special Stage is complete without hazards to avoid. Running onto the rough ground on the side of the track will slow the player down, allowing the UFO to distance itself further away. Running into spike balls and bombs will make the player stumble and lose some of their rings, wasting precious time. There is also the danger of falling down holes or off the side of the track, instantly ending the Special Stage in failure. The first Special Stage is hazard-free and has bumpers lining the sides to prevent the player from falling, but later Special Stages have an increased number of hazards and less barriers surrounding the track. Should the player try to be clever and turn the other way in hopes the UFO will run into them, the UFO will also reverse to trick the player. When the player gets close enough to the UFO, they will automatically Spin Dash into the Chaos Emerald, snagging it and clearing the Special Stage. Scoring at least 10,000 points within the Special Stage will award the player a Continue. In Encore Mode, giant rings are mostly in different places than before. The Special Stages themselves follow the same rules as in Mania Mode, but the background sequence goes backwards from each Special Stage, starting with what is the final background and ending with the first. The layouts are completely different and are much harder. Ring: Gives the player 10 rings. Blue Sphere: Fills a portion of the sphere gauge. Up Arrow: Instantly raises the player's speed to the next level, or increases the Mach Bonus if they're at Mach 3. Bumper: This makes the player's character bounce, and cannot be destroyed. Appears only in Encore Mode. This page was last edited on 14 April 2019, at 11:37.